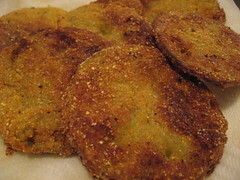 Fried Green Tomatoes are something most people did not know about until the movie with the same name. Even then some probably did not believe it was a real food. Everyone should give them a try. The sweet from the cornmeal and the tart from the green tomato make a great combination. Fill FryDaddy with oil to recommended level and heat oil. Or in a large cast iron skillet add about ½ inch of oil and heat over medium-high heat until hot. Rinse the green tomatoes, and cut into ½ inch thick slices. Discard end pieces. It is entirely optional, for a nice even coating peel the tomatoes before slicing. The tomato skin is slick and the mixture does not adhere to it very well. Pour the buttermilk into a small bowl. Combine cornmeal, flour, salt, pepper, and the optional cayenne pepper if you want it. Dip tomatoes in the buttermilk and then dredge in the cornmeal mixture. Coat the tomatoes well. Gently place in the hot oil. Do not over crowd the slices in the oil. If using a cast iron skillet, fry in a single layer. May want to fry in batches. Fry for about 6 minutes, 3 minutes per side, until golden brown. Carefully remove the tomatoes from oil and transfer to a platter lined with paper towels. Serve immediately with hot pepper sauce. For an extra kick add some hot pepper sauce in the buttermilk before you dip the tomatoes. Can also be served with ranch dip or a sprinkling of parmesan on top.